The Untouchables of Douglas County. 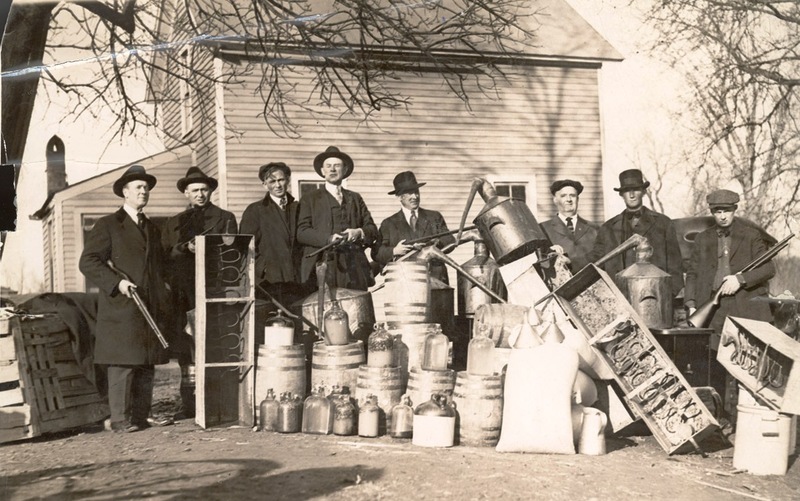 In today’s Throwback Thursday photograph, members of the Douglas County Sheriff Department pose with illegal alcohol and still after a raid in about 1922. Although dating from the 1870s, the city of Lincoln’s preoccupation with the prohibition issue quickened in the first decade of the twentieth century. With the failure of efforts to add a prohibitory amendment to the state constitution in 1890, prohibitionists focused their attention on counties and cities, where they were more successful. The spring election of 1902 in Lincoln resulted in the establishment of a progressive excise, or tax, policy for the city’s saloons, which provided for a gradual reduction in their numbers and limited hours of operation from 7 a.m. to 7 p.m.
Douglas County sheriffs after a raid on an illegal still about 1922. NSHS RG3348.PH10-11 (above).